Restaurant Ratings: Is Michelin Lost in the Stars? Bibendum, a tubby white cartoon man made of tires, made his annual voyage to America last week and awarded stars to 57 restaurants in New York City. Bibendum is not, from the look of him, someone you would trust as the dread magistrate of gastronomy. 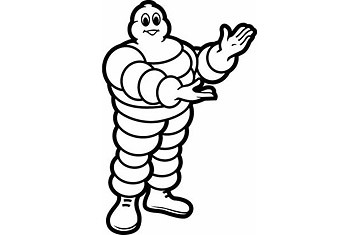 But he is the mascot for Michelin, the company that essentially invented the concept of rating restaurants, and has always been the most important standard in the restaurant world. Whether it remains so  and whether it should  is open to question. Michelin spawned Zagat, Mobil, Yelp and every other restaurant-rating system you can think of, including that of your local newspaper and city magazine, but Michelin has always maintained its mystique. For one thing, its inspectors are anonymous and incorruptible; not a hint of scandal has ever been thrown on them. Michelin does not accept any advertising, and its funding by an entity completely outside the food world helps to guarantee its presumed objectivity. Michelin is far from transparent, however, about what it (meaning its inspectors) considers to be great food. What separates a two-star restaurant from a three-star one? I spent some time with Jean-Luc Naret, the head of the Michelin guide, hoping to get some clarification on what makes a plate of chicken worth a special trip, rather than just a detour. On this point, he was only partially helpful: it has to be "an incredible experience" and absolutely consistent, both for lunch and dinner. But, of course, that just begs the question of what an incredible experience is. We don't know the inspectors; maybe they are blown away by blanquette de veau or soba noodles  something that I might not even especially enjoy. Certainly, you would never be able to tell from the actual book. The U.S. guides (New York City just got its sixth edition, San Francisco will get its fifth later this month and Chicago will get its first guide in November) may be the product of exhaustive connoisseurship on the part of the inspectors, who analyze the food for the quality of ingredients, composition, originality, the personality of the chef and so on, but the write-ups in the book itself are incredibly banal and uncritical. They sound like something from an in-flight magazine. Brooklyn's unstarred Chestnut: "Chestnut's farm-reared chef spends time sourcing the best ingredients and then lets them shine in a menu reminding diners that the best supermarket is nature itself. The simple décor has just the right amount of personality ..." Of Le Bernardin, one of only five restaurants in New York City to get three stars, we are told "[Chef Eric] Ripert is a master of seafood, and his understanding of fish combined with his French technique makes for an unforgettable meal." All righty then! The formula is always the same: a snappy intro, a quick description of the room and service, and then a few lines about food invariably follow, with a cascade of food-copywriting clichés like "perfectly cooked," "wonderfully crispy," "succulent," "a gorgeous tangle of fresh spaghetti," etc., etc. It's not that Michelin is wrong  Le Bernardin is one of the best restaurants in the world by any measure  but you wouldn't know why from this entry. Multiply this white noise by page after page, and you have no sense of exacting standards, a century of tradition or global authority. It's just another crappily written restaurant guide, not even as discerning as the insert from the Dallas Morning News. The star ratings only refer to each other rather than you making decisions about how far to drive. That leaves the brand, and with Michelin, the brand is all-powerful  for now. Naret is an eloquent and persuasive spokesman for the company, and his efforts to modernize and expand it have paid off greatly: the Tokyo edition sold out in a day. But it's hard to imagine that any serious eater would use it in his hometown rather than the long, detailed review of the local critic, who actually says why he likes the place. Or the combined reviews on Yelp, which might be the single best review guide of all, given the ability of each educated consumer to write at length about what he likes and doesn't like. It's not that I don't agree with the Michelin ratings; they're O.K. But I don't understand them, and that's not O.K. I don't know a single eater in New York City who thinks that Corton (two stars) is a much better restaurant than Eleven Madison Park (one star). (Most people, including the critics at the Times, think the opposite.) Both do the same sort of tweezer food; it's merely a question of taste and emphasis. But you certainly can't discern much from their Michelin entries. One has "breathtaking" food and the other "irresistible" food. One has a "perfectly poached" lobster tail, while the other has a "soft, butter-poached" lobster. That's not good enough. Likewise, why does Del Posto (one star), with its "heavenly" pork loin and "perfectly al dente tangle of spaghetti" not rise to the same level as its uptown rival, Alto (two stars)? These questions are on Michelin to answer  and it doesn't. Still, I'll be the first to admit that Michelin serves a unique and desperately needed role in providing a universal, exacting standard for restaurants worldwide. Critics can never be completely objective, but they can be fair, and Michelin probably treats everybody about the same (although I would guess it is extra exacting with the lions of French cooking, like Joël Robuchon or Alain Passard. One might ask how Michelin can extend its authority to other countries at a time when even its own institution is losing its sway to blogs. Naret has a response to that one: everyone needs knowledgeable advice, he says, since nobody knows everything, and so they would do better to lean on Michelin than otherwise. "This is our job, this is what we're doing around the world," he says. "The chefs and the industry see us as the only international benchmark." It's true, and it is Michelin's proudest boast. The foodies in any given city are sure to wildly overrate their local restaurants, and to ask a Texan to judge a quenelle is as silly as hoping to find a barbecue expert in the sixth arrondissement. But the inspectors, whoever they are, surely have their biases too, and as long as we don't know what they're really saying behind the scenes, Michelin will only be able to ride the residue of its famous stars so far. At some point, Mr. Bibendum needs to show what he really thinks, and why. Because going by the write-ups in his U.S. guides, at least, his tires are starting to lose their tread. Josh Ozersky is a James Beard Awardwinning food writer and the author of The Hamburger: A History. His food video site, Ozersky.TV, is updated daily. He is currently at work on a biography of Colonel Sanders. Taste of America, Ozersky's food column for TIME.com, appears every Wednesday. Read "The New Best Restaurant in Asia."